A few years ago I was asked to deliver the keynote speech for the opening ceremony at the Hot Zone in Houston only 12 hours before it was scheduled. Why the short notice? The State Emergency Management Director had an emergency meeting with the governor to discuss a cruise ship which was coming into Galveston with a woman and her husband quarantined in their cabin. This woman, while highly qualified in her job, had tested the blood from the first person who died of Ebola in Texas. The one reason this cruise ship had been denied entry into Galveston and other countries, and caused this meeting with the governor was simple – fear had been driving the system. When the public is afraid, they demand action. They say to their local, state or national government officials; “protect me.” It is very difficult to protect people from fear. We’ve dealt with it for a long time. There is always the lingering fear of a terrorist attack. We’ve weathered the anthrax fear in October 2001 in which 6 people died, and now we’re dealing with the Ebola fear of 2014. Fear clouds perception. This concept makes it very difficult for almost everyone involved in energy emergencies to effectively communicate with the public. The public wants to be absolutely safe in their minds – risk free. It is very difficult to discuss risk with a person who does not want a pipeline, an electrical high power right-of-way, or hazardous materials in their community. Pipeline and electrical ROW meetings are packed with people who don’t want them near their homes, but many actually live within the evacuations zones of interstate highways or railroad lines. Their vision is the threat of an enormous explosion, exposure to electrical or magnetic waves, or chemical spills in their neighborhood. How do we solve this problem? Communication! Politicians demand and legislate this quite frequently. But I suggest the best step is to communicate with the one group that is respected and can truly understand hazards and risks – emergency responders, especially the fire service. Emergency responders can be your best ally or your worst opponent. They are respected in the community. 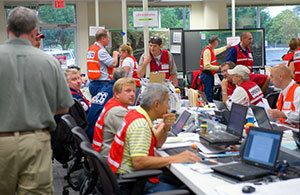 Almost all states have mandates to meet “face to face” with responders annually. If they understand the issues, they can translate or better yet quell the fear, or in some cases, hysteria. I know it isn’t easy. Finally, here is what I have to say. Meet your governmental requirements. Have the annual meeting. Give folks like me the other 364 days a year, and we will help you reduce the fear. That is the first and biggest hurdle.